The English edition of “Commented Games by Lee Sedol, Vol. 1: One Step Closer to the Summit” – which some are calling “a Korean version of Invincible” — is the highlight of eight new books published recently by Korean publisher Baduktopia. Keenly awaited by his fans — Lee wrote the 3-volume series during a leave of absence in mid-2009 when he temporarily stopped playing professionally — the book doesn’t disappoint. Over 320 pages Lee Sedol 9P comments in great detail on three of his own games; click here for sample pages. “Commented Games” also includes unusually honest and frank stories about Lee’s life, thoughts and emotions, providing rare insight into the mind of one of the world top players. 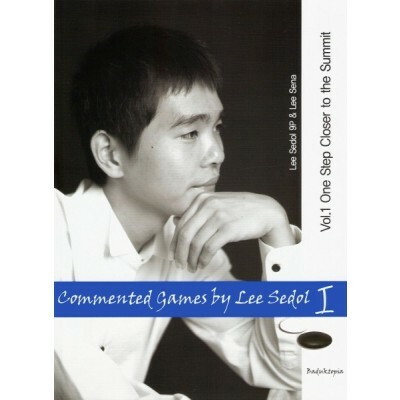 There are three volumes of the Lee Sedol books, with three games in each for a total of nine commented games, the English translation of Volume II is scheduled for release in the first half of 2013. Baduktopia has also released the continuation of the “Level Up! Series,” five new “Jump Level Up!” books along with their answer book. The “Level Up” books contain short explanations, practice problems and entertaining material like comics and texts on go culture. Originally designed for children at Korean Go schools the books are intended to systematically teach essential techniques step-by-step. The “Jump Level Up!” series is recommended for single-digit kyu players. Available from Baduktopia, Go Game Guru and SchaakenGo. Note: the AGA receives a 10% commission on books sold through the GoGameGuru shop.